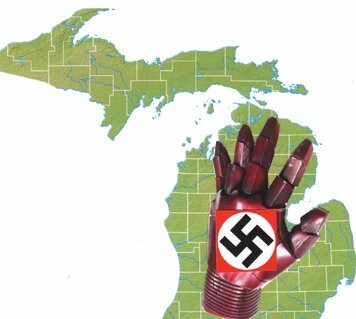 DETROIT — The State of Michigan’s fascist iron glove is pounding on Detroiters, using mass water shut-offs without notice, and mass concentration camp imprisonment at the Mound Road state facility. 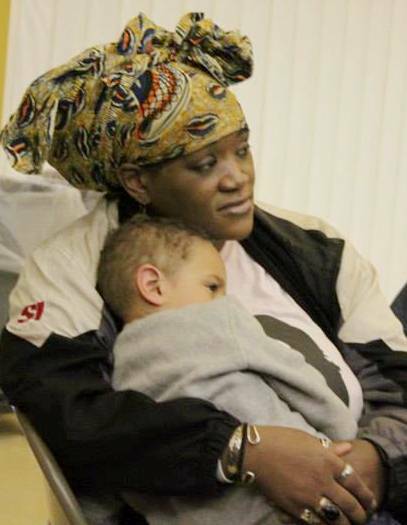 There, hundreds are locked into filthy holding rooms without sanitation, proper food, water and medical care, guarded by Michigan Department of Corrections personnel. Hicks said she told him that was the same explanation given by Nazis at the concentration camps, and by Detroit police when they are busting people’s heads. Hicks said he wore some sort of water department decal without the name of Detroit, over his company badge. She said people she knows living in the Warrendale neighborhood had earlier complained about the shut-off workers not being official City of Detroit employees. 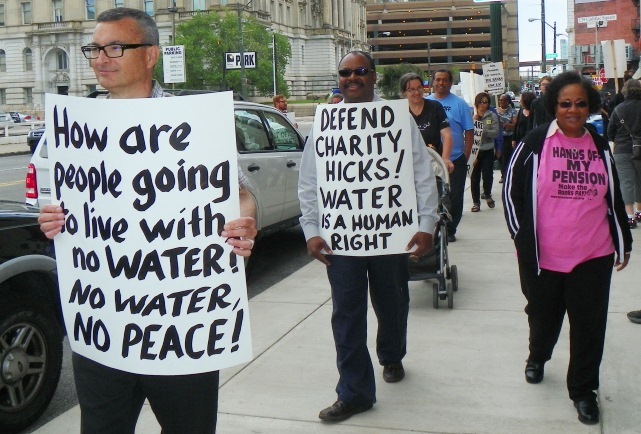 The Detroit Water Board approved a $5.6 million, 730 day contract with Homrich Wrecking April 24, Contract No. DWS-894, “Water Shut-Off/Turn-On Project,” according to the Board’s minutes. Hicks said the contractor got mad when she asked to see the termination orders for herself and her neighbors. 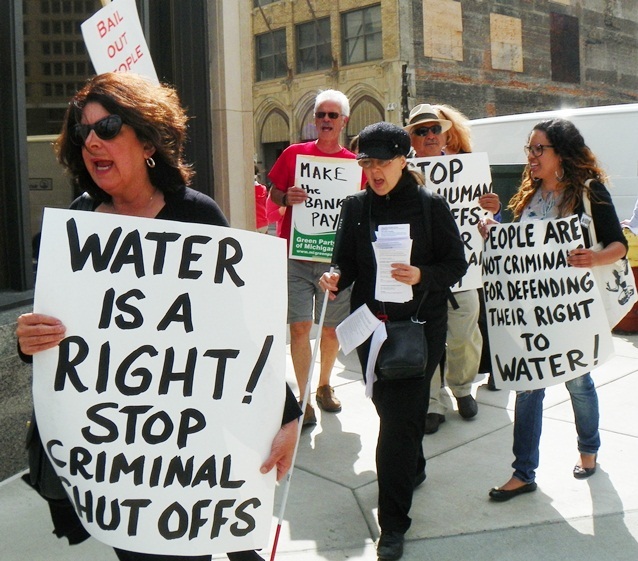 Marcher demands hit big businesses who haven’t paid their water bills first. Hicks said a one-gallon red plastic gas container fell off the back of his truck when he hit a bump in the road. She then called 911 to report that she had been assaulted. Hicks said she had hurriedly dressed and was virtually naked, with no shoes, no socks, no underwear, no keys or other belongings. She said the two officers, who were white, arrested her in front of her home, did not read her her rights, then made racist remarks to her as they drove her to the Mound Road facility. Hicks discovered when she got to Mound Road that everyone arrested in the city, whether for misdemeanors or felonies, is being taken there and booked by the Michigan Department of Corrections, which guards them and takes their fingerprints and photos, then keeps them in state custody. She said she was told she would be there for four days, although state law says arrested individuals must be arraigned within 72 hours. She said she was disrobed and strip-searched. 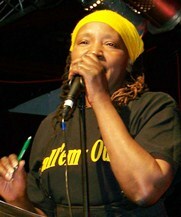 Women in prison; general photo. Protesters at Water Board Building. She said women were separated into two holding areas, one for those brought in for alleged misdemeanors, and another for those with alleged felonies. Hicks said City of Detroit police officers are in the back processing prisoners so they can be video-arraigned later in the 36th District Court, with arraignments for felonies going on seven days a week and for misdemeanors from Monday through Friday. 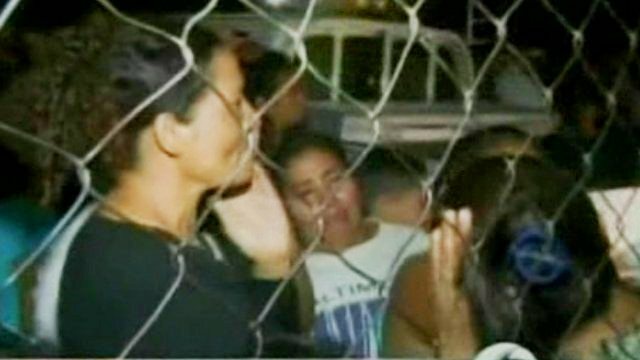 She said staff from the Prosecutor’s office comes through there at all hours of the day and night to interview the prisoners. She said the prosecutors frequently add six or seven more charges to the one the prisoner was brought in for, a tactic that office has long used to get people to plea bargain rather than face a jury composed primarily of non-Detroiters. Attorney Alice Jennings speaks at rally v. bankruptcy April 1. “The conditions are meant to shame you, demoralize you, criminalize you and break you down,” Hicks said. She said attorney Alice Jennings intervened to get her released after two days, and that no charges were even brought after her traumatic experience. Jennings told VOD that she and Attorney John Royal went to the prison to get Hicks released due to her medical condition. She said she tried to visit with Hicks at one of the individual visting sections with glass walls, but the phones were not working in the sections. She asked the guards why she couldn’t meet with Hicks in a separate room, since they had brought her out in handcuffs anyway, but they refused. 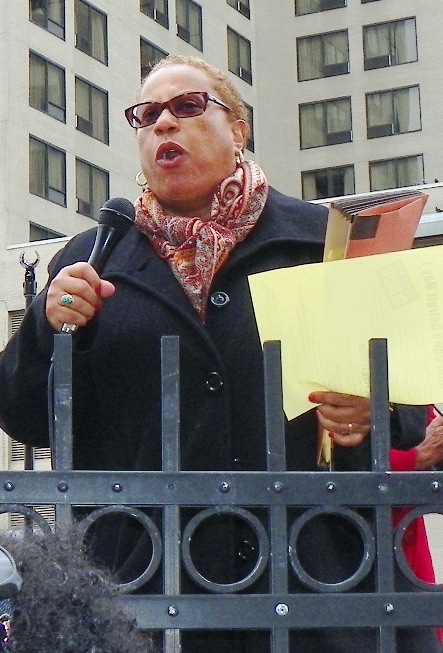 Lila Cabbil of the People’s Water Board. During the May 23 protest, Russ Bellant said Homrich had come through his east-side neighborhood as well, shut off at least nine people on his block alone without notice, then went to other blocks in the area of Seven Mile and Sherwood as well. Protesters noted that the State’s Child Protective Services removes children from families where the water and other utilities are off. 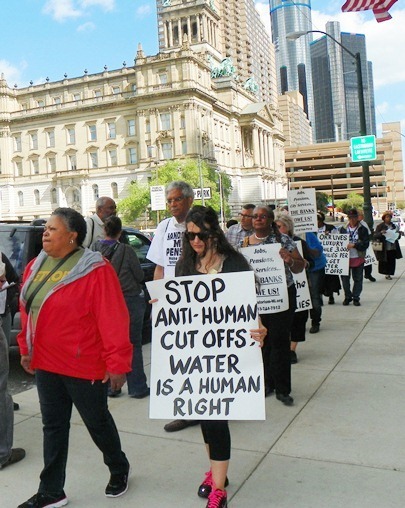 They said that numerous large entities including the VA hospital, the Palmer Park golf course, Ford Field, and others have not paid their water bills but do not face shut-offs. 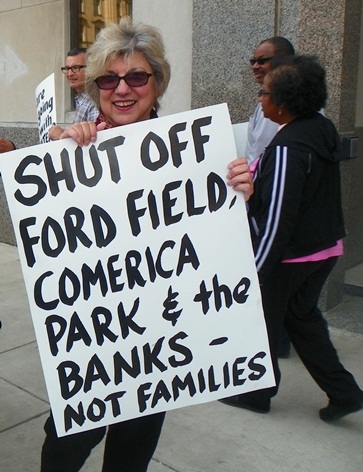 “Illitch owes $80,000, Ford Field owes $55,000, and the golf course and hospital each owe at least $200,000. If they paid THEIR bills there would be no need to shut off poor folks,” Cabbell said. Rev. Bill Wylie-Kellerman went into the customer service area of the Water Board building and began speaking to the numerous people there, telling them that thousands of people in the city are being shut off and are in danger of losing their children. He said guards threw him out despite his protests that it was a public building. “They told me this is a place of business,” Wylie-Kellerman said. She said she has been consulting with people from North Carolina who are visiting Detroit. They have been sponsoring the hugely successful Moral Mondays protests there against that state government’s policies, which closely resemble those passed by Michigan’s legislature and enacted by Gov. Rick Snyder. 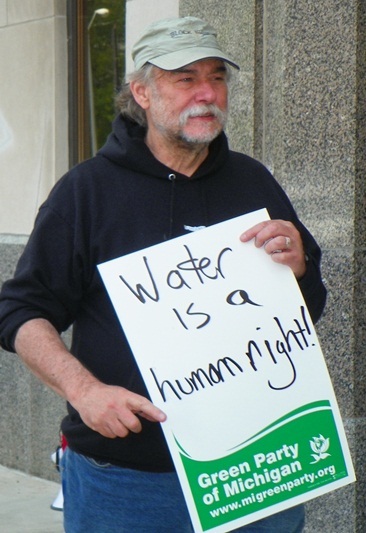 For more information, go to http://moratorium-mi.org/, http://peopleswaterboard.blogspot.com/ and https://www.facebook.com/peopleswaterboard.